In the late 19th century, a German glassmaker by the name of Otto Schott developed what was then a revolutionary new type of glass: It included boric oxide, differentiating the product from the soda-lime-based glass products on the market. This unique material became known as borosilicate glass or, simply, boro glass. Borosilicate can be used in a wide range of applications thanks to its superior durability against extreme and fluctuating temperatures, as well as its high resistance to chemicals. Borosilicate glass has a high melting point, making it much more heat-resistant than many standard glass types. And due to its low thermal expansion coefficient, it is able to maintain its transparency and strength even when exposed to extremely high temperatures; it can withstand a working temperature of 515 °F and doesn’t melt until it reaches 550 °F. Borosilicate glass contains the usual ingredients typically used in glassmaking — quartz, sodium carbonate, and aluminum oxide — with the addition of 5-13% boric oxide, which imbues the glass with its unique qualities. Borosilicate glass is generally more difficult to produce than other types of glass since it requires a higher melting temperature. However, it’s still highly economical, and the advantages are enormous considering the low cost of the product. Plus, the cost of producing borosilicate glass pales in comparison to the alternative: routinely replacing inferior glass that cannot withstand fluctuating or extreme temperatures. Naturally, various innovations have since improved Schott’s original glass design, and today several types of borosilicate glass are available such as BOROSILICATE33® and PYREX® for different types of applications. But the basic principles remain the same; the unique characteristics of the glass allow it to have a low coefficient of thermal expansion, roughly one-third of that of typical soda-lime glass. While borosilicate can withstand high temperatures and thermal shock, cracking is possible. It is unlikely to shatter, though. As mentioned earlier, borosilicate glass can be used in a wide range of industries. Its resistance to high temperatures makes it suitable for various applications involving heat and heat transfer, whether manufacturing telescopes and other types of precision optics or creating high-powered lighting products, such as LED lights and lights for use in the film industry. Boro glass is also ideal for hot mirrors, allowing for the reflection of infrared light. And, of course, most household glass cookware is made from borosilicate glass, as dishes must be able to move from the oven to the refrigerator or vice versa in a short period of time; borosilicate stands up to these temperature extremes that would easily shatter other types of glass. Borosilicate glass is also used for fused deposition modeling and for the removal of nuclear waste. Even space shuttles are coated with a layer of borosilicate glass. Aside from its superior temperature resistance, borosilicate glass also easily resists corrosive chemicals, making it well-suited to many research and medical sectors. Borosilicate glass offers unmatched versatility for all types of high-heat and extreme-temperature applications. 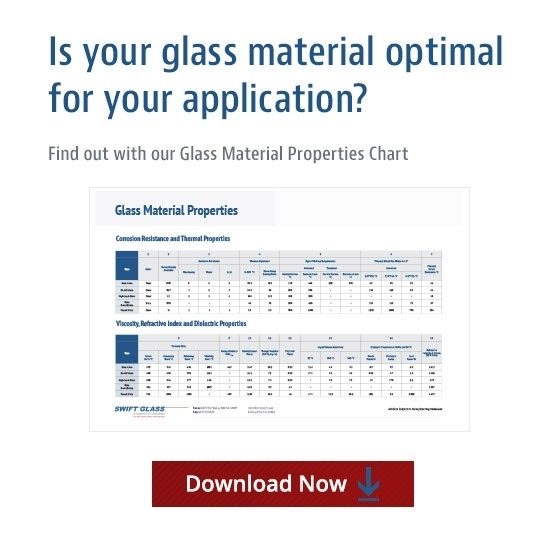 To learn more about this unique material or explore how it can serve your specific needs, request a quote today; the expert team at Swift Glass is on hand to answer any questions you may have.